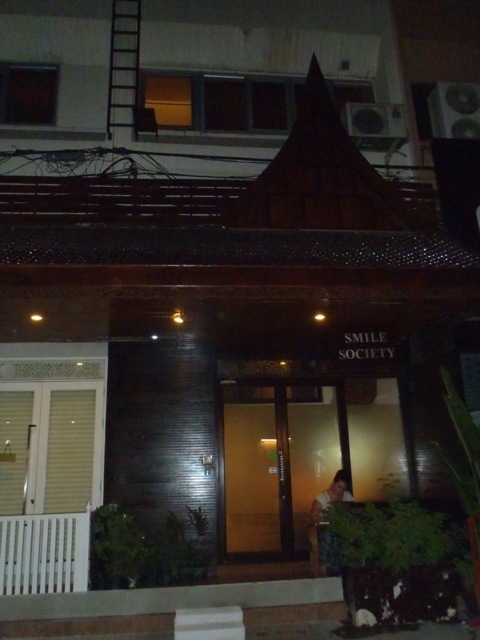 Set back from the busy Silom Road and just a few minutes walk from the Sala Daeng Skytrain station, the Smile Society Boutique Hostel is a small and unassuming building, and is one that you probably wouldn’t even notice if you weren’t looking for it. But not going in and staying there would be a big mistake…it’s a smart, clean and friendly place, with excellent facilities and the loveliest of staff, always willing to lend a hand and give advice, going the extra mile to make your stay the best it can be. There is a common room area with a small library, drinks fridge (tea and coffee are complimentary throughout your stay), foosball table, a tv/movie room, and a few computers which are free to use (there is also free wifi in this area). The entire place is always clean and tidy – probably something to do with the fact that no shoes are allowed to be worn upstairs – and best of all it is quiet and peaceful, a welcoming fact after being out in hectic, bustling Bangkok all day. So while the common area isn’t the most buzzing place to meet other travelers, it is great for just chilling out and taking time to reflect on your day. The hostel also has its own restaurant, which is open 10am to 8pm to the public, while breakfast is complimentary for hostel guests, running from 7-10am, allowing for a little lie-in before starting another day of exploring the city. I would highly recommend this hostel as a fantastic place to stay in Bangkok if you’re looking for something a little more relaxed, quieter and out of the main tourist hot spots, but still with plenty to see and do in the surrounding areas.